At a Feb. 1 press conference, Spokane County Sheriff Ozzie Knezovich effectively said that he won't enforce Initiative 1639, the gun control ballot initiative that voters passed last November, claiming that the initiative is unconstitutional and doesn't create laws that he needs to administer. The legislation — which passed with almost 60 percent of the vote — enacted enhanced background checks, waiting periods, and increased minimum-age requirements from 18 to 21 for purchasing semi-automatic "assault" rifles. It also created a felony penalty for people who don't lock up firearms. In front of reporters, Knezovich slammed the initiative as "unconstitutional" — he claimed that it won't withstand legal scrutiny at "either the state or federal level" — and vaguely written. "In this law there is nothing for me to enforce so I'm not too concerned about it," he said. "Pretty hard for me to enforce something that is unconstitutional." "What would I enforce?" he went on to say. "I can't enforce something that I have no authority to enforce. There's nothing in this law for a sheriff to enforce." According to Kristen Ellingboe, a spokeswoman for the Alliance for Gun Responsibility — the organization that pushed I-1639 — only the law raising the purchasing age for semi-automatic rifles has gone into effect so far. The other components will become active on July 1 to "ensure that there is enough time to educate the public and law enforcement" about the initiative. When asked after the press conference whether he would enforce the initiative after the July 1 implementation date, Knezovich says: "If it’s unconstitutional, the answer is 'no.'" The statements come after a string of other sheriffs around Washington state have publicly declared that they won't enforce the new laws, including those in Klickitat and Ferry counties. The initiative passed with a 20-point margin last year, with 25 of Washington's 39 counties voting againt it. There was outsized support in the west side of the state and a lack of support east of the Cascades. In Spokane County, I-1639 squeaked by with around 4,100 more 'yes' than 'no' votes. In response, Knezovich has criticized those sheriffs as "grandstanding." "I have problems with my peers stepping up and saying 'I'm not going to enforce I-1639'," he said at the Feb. 1 press conference. "Well, that's empty words. I-1639 doesn't give a sheriff anything to enforce." "This is an unconstitutional law. You really want to do something about it? File an injunction and stop it," he added. Shortly after I-1639 passed, the National Rifle Association and the Bellevue-based Second Amendment Foundation filed a lawsuit seeking to block the initiative, arguing that it's unconstitutional. Knezovich says that he's reached out to the attorneys fielding the lawsuit to offer his support and that he would join it if he were asked to. "The day they give me an avenue, I will join that lawsuit," he said. "Our office is confident that Initiative 1639 is constitutional, and we intend to defend it in court," Kate Kelly, policy director at the state Attorney General's office, writes in a statement emailed to the Inlander. In defending his claims that I-1639 is unconstitutional, Knezovich repeatedly pointed to a 2008 case where the U.S. Supreme Court struck down a Washington, D.C., law that effectively banned handgun possession and required that lawfully owned firearms be locked, disassembled, or unloaded when not in use. 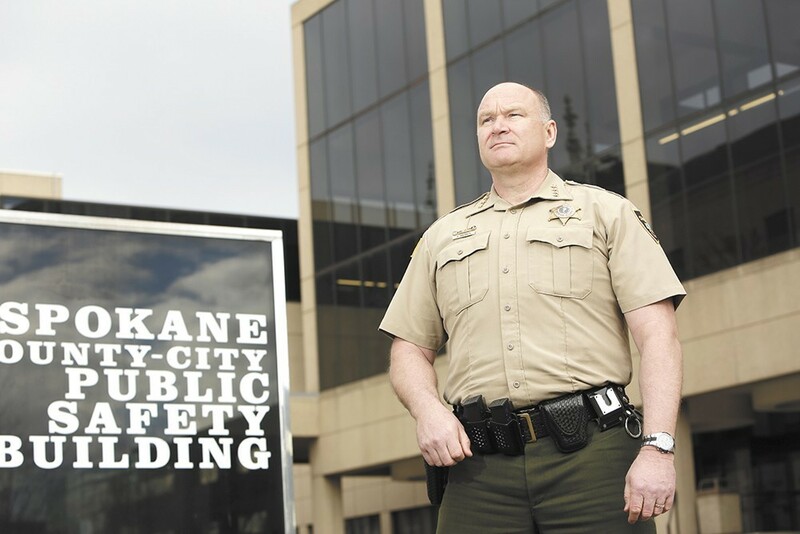 The Spokane sheriff also argued that I-1639 lacks precise language, making it hard to enforce. He emphasized that the initiative doesn't clearly define what constitutes "secure storage." "I-1639 does not tell you how to store that weapon or how to secure that weapon," he said. "How do you charge somebody when you haven't even told them what the actual constructs of the law is going to be?" Ellingboe tells the Inlander that the initiative intentionally doesn't identify specific types of safe storage. "We know that safe storage will look different from household to household," she says. "This model creates an incentive for gun owners to securely store their firearms but it does not prescribe [a storage method]." In cases where gun-owners may have violated the safe storage rules, Elingboe said that prosecutors would have discretion over whether to file charges. "It would be up to the prosecutor to determine whether or not reasonable measures were taken to secure the firearm," she says. Despite criticizing officials in other jurisdictions for not enforcing immigration laws — "If you start picking and choosing laws, this could be very bad for this nation" — Knezovich also argued that sheriffs have every right to make their own legal assessments of new laws. "We interpret the law all the time," he said. "And we also interpret the constitutionality of laws. This is what we do." This post has been updated to clarify how Kate Kelly conveyed her statement.